I’m sure I never give the standard, stereotypical answer they are expecting. I may be a lifelong canner, but like most of you who embark on this journey, I also have a broad background that makes me look at canning with a much wider lens. I may have training in food preservation, but I am also a mother of two teenage boys and I want to leave the world a little bit better for them. When a non-canner asks me why I can, I think they expect me to say something about how I am saving food for later. Of course, that is a big part of it. I have some very passionate reasons for doing what I do and I know most canners share many of these reasons with me. So today, I decided to jot these reasons down. And as I was writing, I realized it was essentially a Manifesto – a list of intentions when canning. Perhaps some of your own intentions align with mine or maybe my list will spark new reasons for you to continue to put up food every year. Below, I thought I’d share my list of intentions with you. 1) Capitalize on Seasonal Flavor. When food is enjoyed within its natural season, it will have the most complex of flavors and the best nutrition. Canning is the ultimate expression of seasonal eating because the whole point is to use fresh ingredients at their peak. 2) Capture That Flavor as a Time Capsule on my Pantry Shelf. The beauty of canning is that later, when the season is long gone I can still enjoy that jar of vine-ripened flavor (even in the middle of winter). 3) Know What is in My Food. 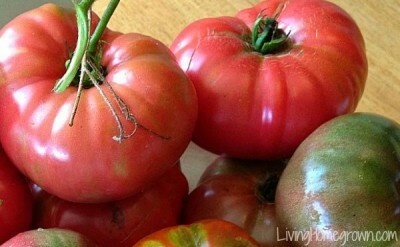 I can food to avoid GMOs and pesticides by choosing only organic, sustainable produce. If I want to put sugar in my jam, then I decide how much and what kind of sugar to use. All the choices of how and what I eat are my own. 4) Support Local because local means fresh and because it helps my local, organic farmers who are doing it right. By eating local, I am voting with my dollar to support farming practices I endorse rather than industrialized farming and cross-country shipping of produce. 5) Save Excess Produce that I grow in my garden or get from a friend so that food is not wasted. Every food gardener gets a bumper crop of zucchini or a tree loaded with excess fruit. 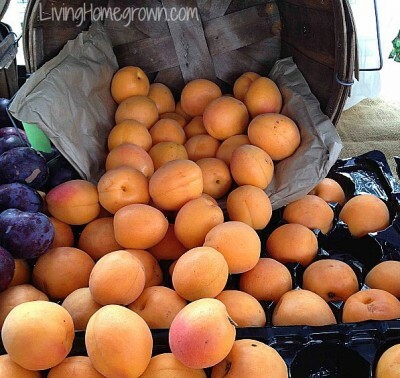 Canning gives us a way to save that produce and eliminates waste. 6) Supplement My Menu – especially if times get tough. Growing my own food and preserving it makes me a little bit more self-reliant. The fact that this extra food is also exceptionally delicious is a bonus. 7) Enjoy Flavors Not Found in the Grocery Store. Standard grocery stores only carry foods that can travel long distances and can sit for long periods of time. Canning allows me to seek out lesser-known varieties not found in the stores. 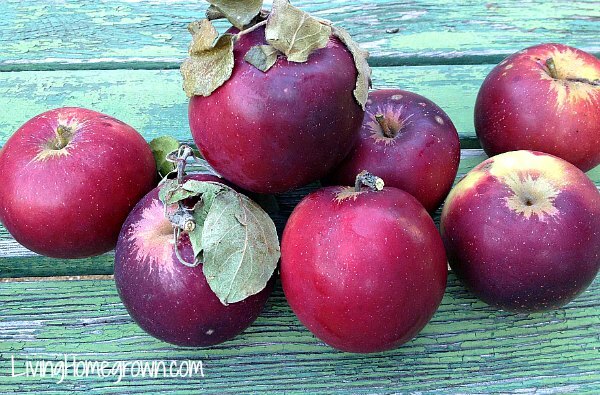 Their shorter shelf life makes them perfect candidates for putting up and I can then enjoy the complex colors and flavors of Arkansas black apples, purple asparagus or watermelon radishes, and more. Canning also allows me to experiment with unique herb/spice combinations and create condiments or sauces that make any cook drool. 8) Share Tradition With The Next Generation. By teaching my kids and other children some of these lost arts, I help connect them with traditions from our past while passing on skills that will last beyond my lifetime. 9) Prove That Real Flavor Is On The Inside and that produce does not have to look perfect to be delicious. Bruised and damaged fruit still makes perfect jam and jellies and irregularly shaped cucumbers are always delicious as pickles. 10) Share My Bounty With Others. A jar of “put-up” produce is very easy to share and always appreciated, especially if you include a recipe or list of ideas on how to use it. Which of the above speaks to you the most?? Or do you have any to add? Can you please direct me on how I can get trained in food preservation. I am looking for certification training. BUT…I should tell you that I am working on an comprehensive online training course for canning and preserving. It will allow you to get extensive training in all areas of preservation and work at your own pace from home. There will be an option at the end of the course to take a test to validate your training and get a certificate. That training course in being developed now, but will not be available for several more months. If you are a subscriber to my newsletter, you will be notified the moment the course is available. I will keep an eye out for the course you will be offering. Will the certificate received after testing out from your training course qualify me for any state licensing, or is it just a general certificate of completion? Also, what is the fee for the course you will be offering? I am asking because I am fleshing out the financials for my business plan and considering all my options (state requirements vs. electives). Very glad I found your site – it is truly a gem and a wealth of information! The certificate will just be for completion as it will not be associated with any state agency. As for the fee, that is still being worked out. I’m sorry I don’t have an answer for that one yet. 🙁 We are still busy filming the training videos and creating workbooks, etc. I’m glad you found my site too! Loretta, while I don’t know that you will get a certification in anything, there is a course for self study on the home page of the National Center for Home Food Preservation (NCHFP), http://www.nchfp.uga.edu. 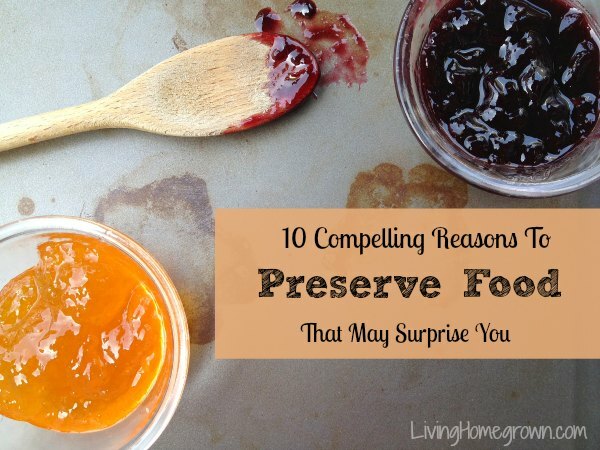 They are my go-to resource for safe food preservation. Good luck in the hunt! #7! This is the one that surprises my non-canning acquaintances. Many do not even think about the possibilities of expanding beyond the basics of pickles and jam. Then I present them with tomato jam, cherry-limequat marmalade, or almond-cherry sauce for ice cream, and they are amazed. And more amazed still when I show them how they, too, can make exciting flavor combos. Recently, I gave a jam collection to a friend who is avoiding bread. She tried to give it back because “what else can you do with jam?” I introduced her to the ideas of jamtinis, jam-and-tonic, jam-based salad dressings, and jelly as a sauce for roasting meat. She’s converted! Oh Laura – You made my day with this comment. YES! YES! YES! I’m so glad you convinced your friend…and what a LUCKY friend to get a whole jam collection from you. Wow! I absolutely love what you said about memories of your grandmother. I hadn’t factored that into my list, but I should. I do believe we measure our time by the special moments we have with those we love. I’m so glad you had that time with your family. I’m sorry to hear you don’t have a local Master Food Preserver option near you. Darn! That is so awesome – educating friends and family adds so much value to our lives! Cherry-limequat marmalade sounds divine! Yeah…And I’m still drooling over her mention of almond-cherry sauce! I’d add: cost savings, especially when you grow your own. Along with not wasting food, the cost of a jar of organic/artisanal salsa or chutney is high! I know I could buy a cheap can of tomato sauce, by mine is a lot better! Materials can be costly, but once you have a stash of jars and a big garden, it’s pretty cost effective. Convenience. It may be day of preserving in late summer, but it makes for many fast winter dinners where you just open a jar or browse your own freezer. These are all EXCELLENT reasons, Sara! I agree with them all. Beside the fact I love opening a jar of my home canned summer goodness in the middle of cold and snowy winter, my home canned jars of salsa and other tomato products, jams, and fruit warm the souls of my far away children. When I cross a couple of states to visit them, my car trunk has a lovely assortment of items I have preserved which I will leave in their cupboards. Many a time I have received a message “Oh Mommy, you have no idea how good your jam tasted this morning on the pancakes. It made me feel like I was with you in your kitchen.”. Or the pizza sauce, the cherry pie filling, or whatever I had access to the previous growing season. Everything is something I grew in my garden or picked locally. Currently making chive blossom vinegar as well as rhubarb syrup. My goal this summer is watermelon rind pickles as good as my grandma’s – a huge challenge. I dehydrate some of my produce as well as freeze, but there is something so satisfying about a couple of shelves holding jars of glowing produce, waiting to be shared with family and friends, used and enjoyed. This is from a single, middle 60’s woman living in a suburban subdivision of a large metropolitan area. Less lawn, more garden! Oh Linda – How lovely! I love the part about your children feeling as if you are there when they open a jar. That is beautiful. Your preserving projects are so admirable. Very impressive. More garden indeed! We are the lucky recipients of my M-i-l’s canned salsa and tomatoes As well as my Dad’s canned peaches and plums. It is indeed wonderful to open a jar that came from them and enjoy the feeling of being loved. You make so many interesting things! Much more adventurous than my family. Do you have recipes or links? Theresa has a nice rhubarb syrup recipe. Chive blossom vinegar – many people provide good info on various web sites. Basically heat white wine vinegar and pour over cleaned chive blossoms. Cover and store in dark place for a couple of weeks. Make sure no metal comes in contact with the vinegar, including the cover of the container. Metal gives vinegar a nasty aftertaste. Ick! After a couple of weeks, strain the now lovely slightly pink vinegar and use on salad, fish and chips, etc. So easy to make flavored vinegars with herbs, etc. They add a subtle, nice flavor to salad dressings and other dishes using vinegars. Try adding a tablespoon of vinegar to a pot of beef stew. It is amazing what just that little bit does to the overall flavor of a stew. Thanks! Will have to give that a try. When I go through my mother, grandmother and even my great grandmother’s canning recipes to decide what to do with my produce, I feel a sense of continuity with the women who did their part to ensure the success and survival of their families. On the homestead, the recipe for the relish called chow chow was probably not so much a culinary accomplishment as a way to utilize every leftover vegetable. However, some of the recipes were so good that they hand wrote the recipes in their diaries or slipped them into their cookbooks. A hundred and fifty years later, I have the privilege of trying them, modifying them and remembering the women who left the recipes for me to find. That is so touching. I think you should frame some of those handwritten recipes as a tribute to them. I’m sure they would be honored to know you still make them. I was so excited to hear about your upcoming on-line course. What a great idea! Can’t wait to start! I have been working on the idea for almost a year but am putting the final package together over the summer. I so wish I had it done at the beginning of the canning season, but I had some family issues that forced me to push back the launch date. That’s okay. It will be worth the wait – I promise! That is fantastic Jan – The rhubarb/raspberry jam sounds divine too! along with #3 and #4, reducing our environmental impact. i have jars i got from yard sales, and i reuse them every year. saves on manufacturing and transportation of new containers, and either the landfill or recycling for used containers. when most weeks i’m disposing of only the sealing lid, i feel better about the world i’m leaving for my kids! I also can for those reasons.. I always enjoy my canning party with a sister and a sister in law. We usually do 300 pounds of tomatoes in one weekend. I always can In smaller batches by my self. Beets. Jellies. Salsas. And others. I know what is in my jars of deliciousness. I enjoy giving them away and I always refill jars as long as I get the jars back.. my family enjoys it as well as how I feel giving it. Thank you so much for sites like yours. I am going to do pressure canning for the first time this year and can’t wait to try some of the goodies from that. Canning starts at home. Thank you to my aunts and grandmother. So glad to have you here Angie! I have had canning parties with a few girlfriends, but how wonderful to have them with family. And 300 pounds of tomatoes?! Whoot! Awesome! You get memories and yummy food at the same time. What could be better than that? My reasons for canning are 3, 7, 8, and 10. I also remember a friend asking if it was cheaper to can than buy tomato/spagehtti sauce in the store. My reply was yes , especially if you compare homemade organic to the equivilent in store. In a recent silent auction fundraiser at my church, my homemade marmalades went for $6 a jar for a happy winner. None of the flavors were ones that could be found in stores locally. I love that your homemade marmalades were in demand at the silent auction. I bet they made someone very, very happy! #10. Many people I like to remember at holidays are difficult to buy for, but most of them love something homemade, from canned vegetable soup to strawberry jam or my famous cranberry sauce with orange and fresh ginger. I think of it as love in a jar. My bff called on a cold January night to say she and her husband were enjoying a jar of veggie soup, and that I also gave her a night that she didn’t have to cook! Ahhh – That is so sweet Leonara. What a wonderful gift you gave her. Love in a jar for sure. Have a good day! Thank you for posting. Oh Heidi, my heart goes out to you. That is more than a full time job. I’m glad that canning helps you. Sending hugs your way. I love reading all these comments. My kids, who live far away, enjoy receiving my canned goods. I’ve learned how to package and ship many of them! I feel the same way you do about why I can. I agree with all your points. I love capturing the local bounty, and preserving it for later use. Adding my own twist to a recipe, while maintaining safety measures, is challenging and allows my creative juices to be used. This week, for instance, I canned wild leeks, with a zesty sweet sauce. Sharing my canned goods is also enjoyment. Whether it’s for my daughter’s friend who wants more jam, a friend who loves my pickles, my annual Christmas present for my brother, or a gift basket donated to a charity auction, I find myself making extra whenever I can so I can share the good bounty. All your canning adventures sound wonderful! The wild leeks sound so good!! Count me in for all of the above! the time of year? I know this may not be the best place for this post sorry for that. Glad you liked the post and I’m so glad to hear you are diving into canning. Be sure to stay signed up with my newsletter. I have some basic canning training coming up later in the year. I would do it now, but we are in full production with the PBS TV show and that takes all my time. Posting your question here is just fine. Ask me anything, anytime! I’m happy to help out. Always enjoy the info on canning!But am wondering about using an electric pressure cooker to can with? Your thoughts? I need to be sure I am understanding your question. A presser COOKER is a different thing from a pressure CANNER. You cannot can properly in a cooker. You need a pressure CANNER. Do you have a link to what you are referring to? Convenience is definitely a big one for me. I just started canning this year and have started out with some things like beans. I made some that can be used as easy refried beans, planning to do some chili seasoned beans, etc. None of the yucky scary stuff in the commercially canned beans but faster than having to remember a day in advance to soak beans, etc. I enjoy the processes involved in gathering, cooking, canning, and storing beautiful and delicious foods for enjoyment now and later. 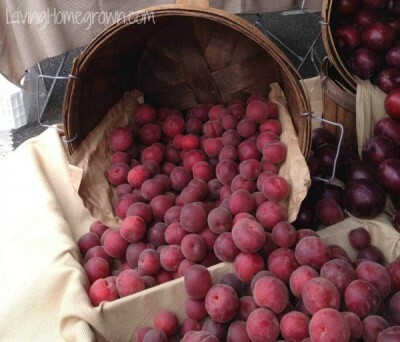 Living in a city, I’m not able to grow my own foods; but I grew up in the country surrounded by fruit orchards, and my heart has always been firmly rooted in the “homesteading” practices of old. Going back to the “old-fashioned” ideas that I grew up with such as home canning makes me feel like I’m living the happier, simpler life once again that I knew as a child. Great article! I also love the ease of having everything I need to do a meal quickly. I also know what’s in it. I have four daughters and none of them have ever wanted to learn canning or dehydrating. Very sad to me. I hope one day, soon, they will see the importance of this lifetime skill. New comment on an old article. I can a lot of meat and dehydrate a lot of vegetables because they are cheap in bulk and convenient in those forms. Canning/dehydrating allows me to have them on hand in appropriate quantities, available for meals later on. They don’t freezer-burn in jars. I take them camping. Home-canned meat and fish are vastly better than the commercially canned meats. Dehydrated veggies make soups a breeze.